North Texas’ premier electrical contractor, Lightfoot responds with a licensed Master Electrician in fully equipped vans to handle your residential repairs, remodels, new construction, installations, and maintenance contracts. Servicing the Weatherford & Parker County areas since 1983, we are proud of our heritage. Our customers know they come first and can count on us to take care of their electrical problems. With us, you know your electrical problems are going to be handled by “The Good Guys” at Lightfoot Electrical! Our licensed and well trained electricians will respond quickly to handle your residential repairs, remodels, new construction, and maintenance contracts. Our professional team is licensed, bonded, and insured. We will respond same-day for an emergency and arrive on time for an appointment. We want to save you time and money on all your work orders. Our electricians do the job on the spot and always clean their work area when they are done. When you have a complex project, we will meet construction deadlines and perform our work to a level where we know it will pass inspection. Our Technicians are equipped to manage all of your commercial building electrical requirements at every level. We work on commercial jobs that range from multi-million dollar new-build projects to minor electrical installations and repairs. Because we know the commercial client has very specific needs, our goal is to create an electrical system that insures safety and energy efficiency to help keep your company’s bottom line in the black. Our employees will equip workspaces for maximum productivity today and make allowances for changing or growing needs over time. 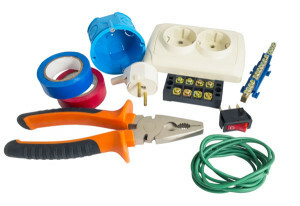 Are you thinking it may be time to upgrade or replace your electrical panel? We can help! Many commercial buildings are repurposed over time, but these alterations are usually just cosmetic in nature. It may be likely that the underlying electrical system is old, inefficient, and unreliable. Many businesses are operating with insufficient electrical support for their modern appliances, information technology, and display cases. Increasing electronic consumer use and energy consumption can result in an outdated system being easily overloaded. You know that an overloaded system can cause outages that lead to costly downtime for you and your company. You can trust our electrician to be the expert on saving you money on your electricity expenses. There have been tremendous changes in the commercial lighting field. Lightfoot is able to look at your current configuration and recommend new lighting technology that will positively impact your bottom line the first month. We can also advise you on any state and federal rebates programs that may apply to your project. This is just another way our reliable staff members will partner with you for greater savings.